The graphic, shown below, shows the latest data on crude oil-by-rail movements around the country and the surge in oil shipments from North Dakota to the different corners of the country. Last year, trains transported more than one million barrels of oil per day in 2014 – a huge jump from 55,000 barrels per day in 2010. Railroads have already taken some steps to improve equipment with better braking systems and upgrades to the track infrastructure. New practices can improve safety as well, including better track inspections, speed restrictions for oil trains and choosing routes to reduce exposure to population centers. Railroads have also increased the use of freight car defect detectors installed alongside the the tracks that automatically identify mechanical defects on the railcars based on force, temperature, sound, or visual measurements. The industry standard needs to be improved, say safety officials, but it’s unclear who will pay for upgrades. An economic analysis from 2011 estimated that the annual train delay costs due to railcar defects (resulting in trains stopping unexpectedly enroute) was over US$15 million for all US Class I railroads. For comparison, each year the four largest US Class I railroads spend an average of $35 million on track and equipment damages due to main-line derailments. Thus, the economic drivers behind the reduction of derailments and train delays are quite substantial. However, movement towards such legislation has presented considerable challenges due to the fact that the vast majority of tank cars are owned by private companies other than the railroads that transport them. As a result, questions arise regarding who should bear the economic burden of replacing and/or retrofitting the crude oil tank car fleet. Due to safety and economic incentives mentioned above, some railroads have already begun to purchase their own improved tank cars, but this has not become a universal trend across the industry. 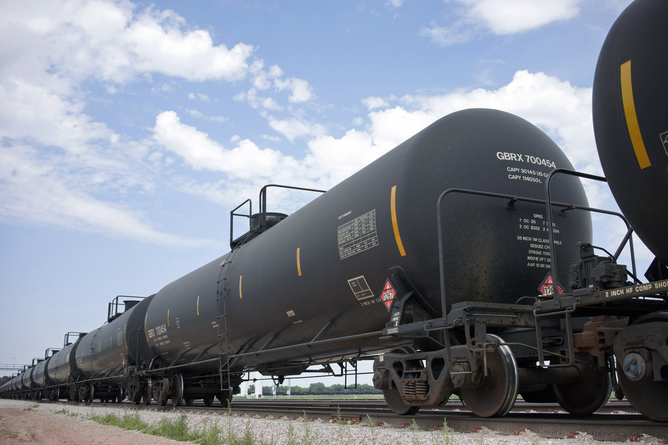 Improved Tank Car Design: The Association of American Railroads (AAR) is working to promote tougher federal standards for tank cars carrying crude oil and other hazardous liquids. Extensive research is ongoing both within the Federal Railroad Administration and at various universities to assess tank car safety and develop an optimized tank car design: Cooperative Research in Tank Car Safety Design. 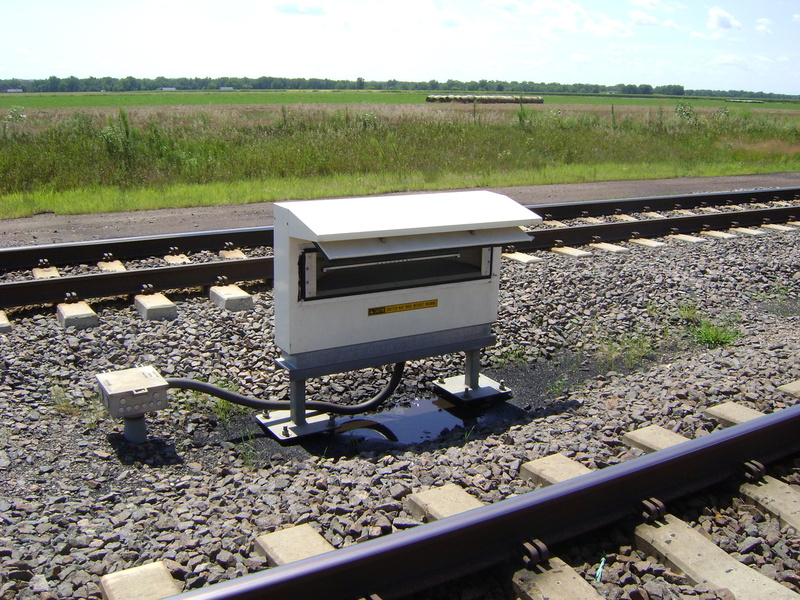 Acoustic bearing detectors, the white-colored machines on either side of the tracks, take sound measurements which allow railroads to predict when railcar roller bearings are beginning to wear out. Track and Infrastructure Inspection: Railroad track failures have been found to be a leading derailment cause in the US. As a result, railroads have begun to perform more track inspections, including the use of advanced track geometry vehicles – which use laser systems to measure the profile of the rail – on routes carrying crude oil trains. Ultrasonic rail inspection methods as well as ground-penetrating radar systems are also being developed to improve the ability of railroads to detect track defects. Risk Assessment: Railroad transportation risk research associated with hazardous materials is ongoing. Risk assessment has included rail defect inspection, evaluating routing and train speed, track quality and an integrated framework to reduce risk. This framework addresses operating practices, train routing, infrastructure, and car design to identify the financial and safety risk associated with hazardous materials transport by rail. 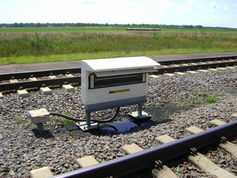 High-tech rail: a closer look at an acoustic bearing detector. load impact sensors to identify damaged wheels that are out-of-round or exhibit flat spots. Advanced Braking Systems: Both technology and operating practices can play a role in improving braking for oil trains. Some have suggested the use of Electronically Controlled Pneumatic (ECP) brakes. ECP brakes allow for faster application of the brakes on all cars in a train using an electric signal, instead of an air signal, to initiate a brake application. two-way end-of-train devices (EOTD) that allow brake signals to be initiated from the rear of the train. Both of these operating practices result in faster braking and reduce “run-in”, where the cars in the front of the train begin braking before those on the rear, causing the rear cars to “run-into” the cars in front of them, creating higher in-train forces. After these measures were proposed by the US Department of Transportation in July of 2014, US Class I railroads agreed to implement enhanced braking in the form of distributed power or two-way EOTDs on all oil trains. 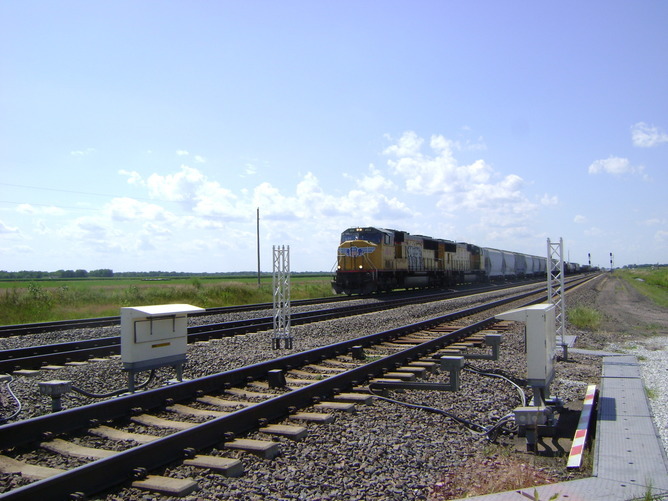 Positive Train Control (PTC): This technology will automatically slow or stop a train to prevent a collision or derailment due to human error, such as speeding or missing a signal. After a federal mandate in 2008, railroads have begun to develop and install this GPS-based safety overlay system, which will eventually cover more than 60,000 miles of track in the US. Emergency Response: Railroads are working together with various organizations to improve community safety through emergency response training. In addition, new technologies are being developed to improve the speed and effectiveness of environmental cleanup efforts. For example, researchers at Penn State University have developed a patented technology called Petro-SAP to absorb oil from the environment after a spill. Technologies like this can be used in the future to mitigate environmental impact of train related oil spills. While the risk associated with oil train derailments has not been eliminated, the transportation of crude oil by rail has certainly become safer through extensive research, development and implementation of new technologies. Continued efforts by railroads, government agencies, research institutions and universities will continue to improve the safety of crude oil transportation by rail, reducing risk and potentially alleviating public fears associated with railroad transportation. 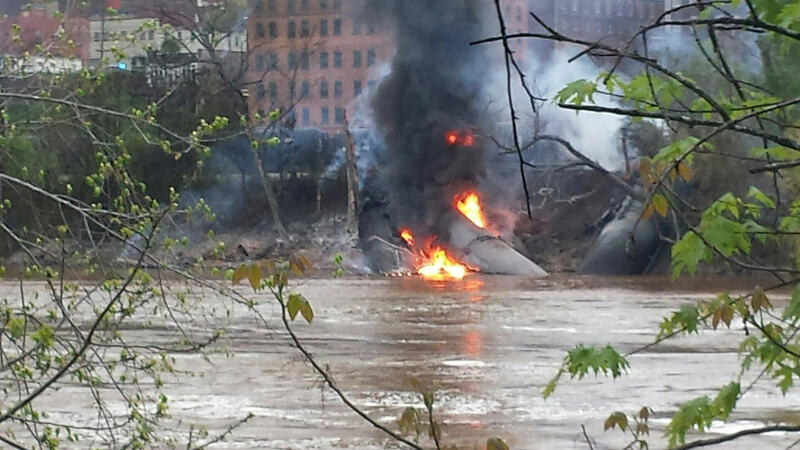 For more on transporting oil by rail, see: Despite disasters, oil-by-rail transport is getting safer.